For anyone that knows me you know my style is rather classic and simple which I love to spice up with some statement jewelry! Just like clothing where I mix high end with street, I love to mix high end jewelry with faux bijoux; but this needs to be carefully done as to avoid any misinterpretations. 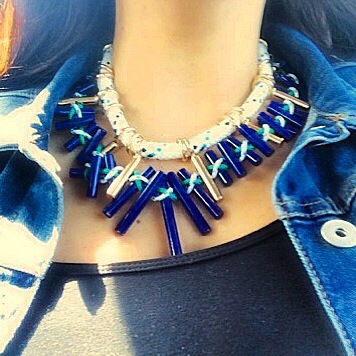 If I am wearing a statement necklace I almost always pair it with high jewelry studs; and vice versa. When wearing a statement bracelet never pair it with real jewelry as to avoid any discoloration and scratching. For each piece regardless of what it is, it deserves to serve it’s purpose on it’s own. If you wish to layer make sure you are picking from the same caliber. Below is my most recent purchase, I absolutely fell in love with the deconstruction and color of this necklace.